Calculation of block brake time automatically to decelerate linear from enter to in. The task of BBT is to ensure that locomotives / trains arrive as precisely as possible with the speed V_min at the IN detector. The locomotive is braking in a predetermined number of steps between ENTER and IN, as Rocrail sends decreasing speed commands to the locomotive at regular times. If the locomotive arrives at the IN detector after an attempt at a higher speed than V_min, Rocrail calculates a faster sequence of the steps and tries it with the next attempt. If the locomotive is at V_min, long before it arrives at the IN detector (and now creeps to the IN detector), then Rocrail calculates a slower sequence of steps. With each iteration, the sequence becomes more accurate to finally reach the IN detector with a point-to-point accuracy of V_min. In those cases, where the setting of the different speed steps between ENTER and IN is visually recognizable (i.e. jerking of the locomotive), you have the possibility to configure Rocrail in such a way that more steps can be used. The BBT records can be sorted by clicking on one of the columns headers. 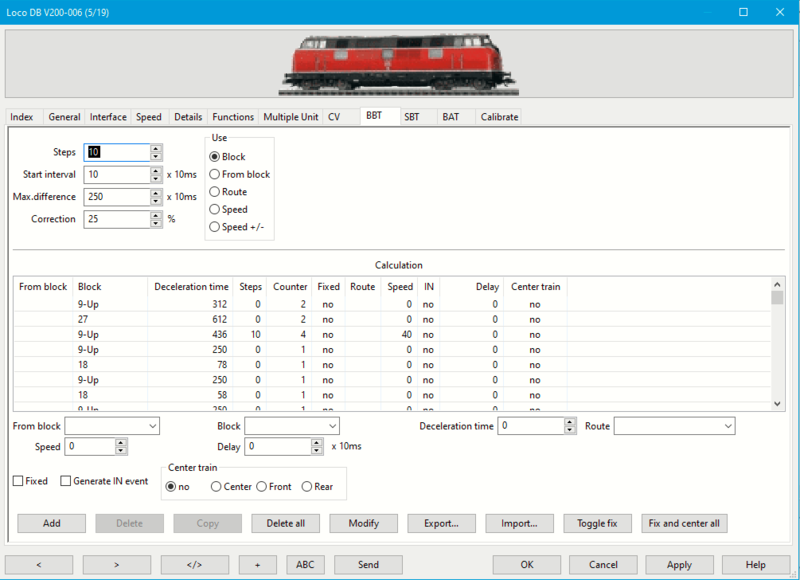 The Block Brake Timer for this loco is only active when the BBT-option for this loco in the details tab is set and the loco enters blocks with the BBT-option set. The number of steps preset to use for BBT. The actual number of steps in the BBT records can differ from this number; All depends on the enter speed. After the learning process is finished the number of actual steps should be equal. This value is used as start for a new BBT record and will be used as the initial timer between the steps. It may be, that the default 100 ms, 10 x 10 ms, is to low to get a fast learning curve. The interval is an approximately value and is Operating System dependent. Longer differences will be reduced to this max. to avoid unusable values in case a train stops or is derailed between enter and in. The default value is 250 = 2.5 Seconds. After each stop in a block the BBT is re-calculated. This percentage of the difference is used as correction. 25% is the default value which has been proven to be a good choice. Use a higher value to speed up the learning curve. 100% can also be used. This option determines which record key will be used to create and to lookup. For the block in which the loco stops a BBT record is created, independent of the entry side of the block. Note: The From Block column is in this case irrelevant. For each from block a separate BBT record is created. This method does not function if the loco has the Free previous block on enter active. For each route a separate BBT record is created. For each speed a separate BBT record is created. Note that Rocrail only knows the locos speed setting and not the locos absolute speed at enter. This is only relevant if the loco is still accelerating or decelerating when it passes the enter sensor. The same as Speed, but with regarding the block enter side. Number of 10ms cycles before activating BBT. This value can be set by the user and is for fine tuning on the brake point only. The default value "0" will start the BBT immediately on enter. Use with care or set to zero. The block for which the calculation has been made. The deceleration time is in units of 10ms. This is the time between enter and in and will be divided by the number of steps. The steps column shows how many steps could be counted for last run between enter and in. e.g. if the loco had stopped far beyond in the value will be less than target. The number of calculations for this BBT record. No corrections will be written in this BBT record if set to fixed. This can be useful in order to prevent an already determined optimum setting from being inadvertantly changed automatically. The time in which a loco brakes to V_min can be altered intentionally and set. At the end of the intervals an IN event will be generated. This can be used to create a loco dependent stopping point. For more information about this option, see BBT Generate IN. If the Block has Length and Center train set, this option can be used to calculate the interval for stopping the train approximately in the center/front/rear of the block platform. An IN event will be generated. The Fixed option of the BBT record must be set. Note: Before activating this option the BBT learning procedure has to be complete! That is, the train should evenly decelerate between ENTER and IN without the train 'creeping' a longer distance with V_Min. Thereafter the BBT entry has to be set to fixed, then option Center train can be activated. The length of the train (loco and cars) and of the block must be set. No BBT updates are received if Monitoring is off. In this case closing the dialog with OK could erase existing BBT lines. A BBT line with the set parameters will be added to the list. Delete a selected BBT line. A copy of the selected BBT line will be added to the list. The modified parameters are inserted in the BBT line. Export all BBT lines in a XML file. Import BBT lines from a XML file. The fix flags of the selected lines will be toggled. Set all BBT records to fixed and center train. It needs multiple stops in a block for (re-)calculating a right interval; The first times it won't fit. At every stop block it is re-calculated. Longer differences will be reduced to the max. difference to avoid unusable values in case a train did stop or derailed between enter and in. The brake step is: ( V_enter - V_min ) / steps. The calculation is for each block and will be saved in the Plan/Loco XML file. The enter and pre2in events do not adjust speed. Stop at pre2in and Use shortin event will also be used with BBT activated. If the BBT is too short the loco will run at V_min until in. If the BBT is too long the loco will run with a higher speed than V_min until in; The loco could run over. After editing the loco Train the previous calculated BBT will probably no longer fit because of the changed load; Extra learning stops are needed. BBT is only for blocks without external stop. Staging blocks with In event at train length is regarded as a block with external stop. Do not set the decelerate decoder CV 4 to zero. The use of Event Timers will not lead to a stable interval; Reset them to zero! Use as less brake steps as possible to reduce communication overhead; 10 steps is default and a good choice. Use at least 28 decoder steps; Better are 128. To get used to this function it is advisable to set a linear speed curve in the decoder. The longer the block, or the distance from the start of braking to in, the more steps and higher CV4 value should be set. BBT needs extra CPU power so disable BBT if its not needed.